Published March 16, 2015 Disclosure: We may receive compensation if you sign up for or purchase products linked to below. We try our best to provide the most accurate information, but details do change. Please refer to the company website for the most up-to-date information on any lead or recommendation. One of the hottest online business models of the moment is dropshipping. In this unique setup, you may have an online store selling tangible products but you never touch the items yourself like you would with Amazon FBA. The manufacturer or distributor creates the product, stores the inventory and ships the product to the customer. You are just the middleman making the sales and collecting the money. You don't even place an order with the manufacturer or distributor, aka the dropshipping company until you make a sale. Many entrepreneurs have chosen this route because there is less initial investment required and it makes a great weekend side gig. You are not investing tens of thousands of dollars in product upfront. You place your order with the dropshipper as they come in. That does not mean there isn't risk involved. You need to partner with a reliable company to ensure those orders are fulfilled in a timely manner. And there are a lot of scammers in this industry. So how do you know who's legit? And how do you get started? Today we are sitting down with Simon Slade, CEO and Co-Founder of SaleHoo, a site devoted to helping people make money dropshipping on eBay, Amazon and more. Tell us a little about yourself. What was your motivation to work from home? While working full-time at Hewlett-Packard, I sold on Trade Me, New Zealand’s local online auction site on the side. My success prompted others to inquire where I found my suppliers. 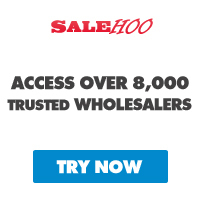 I received so many inquiries that I recognized the need for a directory of verified suppliers, which is now SaleHoo. My intentions were not originally to become an entrepreneur but after the opportunity to become my own boss and achieve professional freedom presented itself, I jumped at the chance. Now I love working at SaleHoo to help others achieve these same goals through selling online. Drop-shipping on eBay is not something we have covered before. Can you tell us a little about it? When people think of selling on eBay, they often think of selling the unused items in their basements and garages. That can be a fantastic way to start selling on eBay and learning the various features of the site, but you have a finite source of items to sell. Drop-shipping is the way to take your eBay sales to the next level. Drop-shipping refers to selling items to consumers while the supplier sends the sold products directly to the customers. This method offers incredible income potential with very little costs upfront. Plus, you never need to build an inventory or ship products, which can be both expensive and a hassle. If you’re interested in pursuing drop-shipping, you should check out our Complete Guide to Drop-shipping. If you’re not already familiar with selling on eBay, start with selling some unused items around your house to familiarize yourself with the site. You’ll need to register as a business with your state and obtain a Sales Tax ID. The cost can be as little as $25 or as much as $800, depending on what type of business you select to create. The cheapest option, a sole proprietor, should suit most sellers’ needs though. If there is one word of warning or something you think all new sellers need to understand before getting started what would it be? Selling on eBay can be incredibly lucrative, but don’t forget that it is a business. To maximize your profits, you should advertise (social media, email marketing, pay-per-click ads, etc. ), as you would with any business. Also, finding profitable drop-shipping suppliers can be a challenge, so I invite beginners to check out our guide to finding suppliers. I recommend new drop-shippers turn to SaleHoo for advice. SaleHoo offers over 50 free video lessons on how to get started, a blog providing the latest industry news and advice, and a community forum for sellers to ask and answer questions. Most questions receive a response from a staff member as well to ensure at least one answer is from an expert source. What's one online business tool you happily pay for month after month? Customer.io analyzes our customers’ individual interactions with our websites and sends messages to them accordingly to ensure they maximize our products and services. Rather than wait for them to run into a problem and contact customer support, Customer.io helps us proactively ensure our customers have a positive experience on our websites. Visit SaleHoo to learn more about how to make money dropshipping. If you have experience in this industry, please share your favorite resources and words of wisdom in the comments. Many dropshipping companies are open to international shippers, Christi.